• Detergent dispenser with 4 compartments. 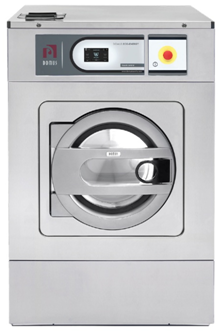 • Self-service version available by installing a central pay or coin meter on the standard model. • CE, WRAS and GOST approved product. Optional version for ETL certified product. Double drain kit, allow the recovery of the water, with important water savings. For models DHS-18. • Drain pump kit for models DHS-11 and DHS-14. • Bottom cover and plinth for loading height 850 mm from door bottom. • Auto Weight. Weighing sensor system on feet. • Steam kit to transform an electric or hot water heated machine into steam version. • Self-Service Kits: Coiner and box; Central pay; Delayed opening door option in case of power outage.